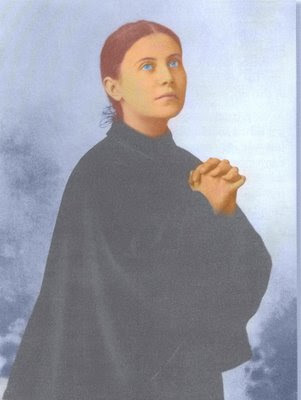 The source for this article, rich in the sayings and statements of St. Gemma, is from the Italian book "La Povera Gemma" written by Padre Enrico Zoffoli C.P. and published in 1957. The book is a 1014 page hagiography on the life of St Gemma. The webmaster would like to extend a heartfelt thank you to Mrs. Rita Dunn for translating it into English. May God bless her for her efforts. "The Answer", Chapter IV of "La Povera Gemma" ("Poor Gemma") by Enrico Zoffoli C.P. At God's first call, Gemma not only offers no resistance, but she exults in joy and begins [without hesitation] her sorrowful journey. She begins by physical sacrifice, then she relives the Mystery of the Cross illuminated by her sincerity and by the piety of her spirit. The first dominant [ theme ] is that God, Most Amiable Father, who is Victim and who agonizes for the salvation of the world, asks her to participate in His pain by purifying herself, and by making reparation for others. 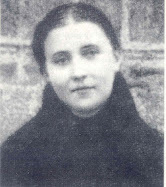 Sister Elena Guerra [her school teacher] must have explained abundantly to her about the mediation of Christ and the deep and true nature of His Passion. However even at the height of the Saint's mystic life, she does not always reveal to us distinctively the stronger lines or paths of the Theology of Reparation. Very rarely Gemma contemplates Jesus as "The Way" , if we analyse her own writings. He is for her always "The End" -God without much distinctions. Thus she does not speak of Him with that clarity that we would prefer like the "New Adam" in the Pauline theology [Theology of St Paul] as the moral Head of a fallen humanity. Reading the "Ecstasies" or "The Letters", one could receive the wrong impression that Miss Galgani conceives and relives the Passion as a torture caused to Jesus by the Jews, by man's sins, as a offense done to God. However this is a question that is lightly hinted [on her Ecstasies or Letters]. Our Gemma does not explain much. What happens is that the sweeping wave of her charity does not allow her to use a desirable level of precision in language. She is a Mystic and does not worry too much to rectify phrases as they appear in current manuals of prayer or common themes of popular preaching. For Gemma, it is sufficient to understand the most orthodox aspects as they best assist her soul. Drawn towards Calvary, Gemma is attracted towards the altar and the Heart [as described by] Paray-de-Monial [St Margaret Mary Alacoque and the Sacred Heart devotion -ed] that reminds the most intimate souls that they are bound to do reparation. The worship [ towards the Passion of Our Lord] preached with edifying fervor by Monsignor Volpi, especially in the aspects of its cruelty and its sacramental value, received in Gemma's spirit the most fervent devotion. She becomes inseparably associated in the redemptive work; she is ineffably participating in the Agony of the Saviour and in the Sorrows of Our Lady in which Miss Galgani pours out her entire heart as "daughter". The answer to the call therefore being one by the motive that inspired her, is at the same time varied, and reveals to us the door to a spirit worthy of our study, and rich in its teachings. Article1: "Oh Precious Pains of Jesus"
We are convinced of the inimitable style of literal beauty of Gemma's words and expressions, so we prefer to transcribe with fidelity her texts in the conventional order they are presented. In this way the world will be able to taste the originality and distinct power of the voice of the Mystic from Lucca. If we should limit ourselves to simply convey the "meaning" it would be equal to corrupt her words . The words of a Saint must be treated as live relics because they save parts of a great soul. "Two sentiments and two thoughts were born in my heart the very first time that I felt and saw Jesus dripping in blood. The first one was to love Him , and to love Him to the point of sacrifice....the other thing that was borne in my heart after seeing Jesus was a great desire to suffer something for Him, seeing how much He had suffered for me!.." Two relevant points. In Gemma the sentiment precedes the thought as she seems to reveal. It is certain that Grace already from the beginning was adapted to her psychology, following the method that her actions came from her senses, and from the heart, and then reached the intellect. Moreover love pushes her to sacrifice, and in it [we find] the most concrete proof of her gratitude. This love clearly indicates her rational and supernatural mysticism and the most convincing motive of her " answer" [ to the call]. "Oh Jesus, You tell me to embrace the Cross; where Jesus? Not anymore upon You [ the Cross] but from now on upon me. Oh Holy Cross, let me embrace you!" "You ask for sacrifices? I will make as many sacrifices as You want. My entire life must be a sacrifice. I will endure all....Jesus the more difficult my cross will be for me, the more similar it will be to Yours." "The Cross of Jesus is the Tree of Love that Jesus has planted into my heart." "Let me tell You again: I am looking for Your Love, Your pain, Your sufferings." "You have really been killed out of Love : Jesus make me die of love..."
" I will sacrifice all for You; I will be faithful...". "I want to receive a Grace from Mom [ the Virgin Mary] - she wrote to Fr. Germano in October of 1900 - " Listen [father] to what I want: I want to receive a cross, but a large cross. This is the gift that I ask. It must be large, so that I can folllow my Crucified Jesus with it..."
I would like to suffer all myself... those blasphemies I hear; Jesus they make me ill. Who is it Jesus that makes you suffer so?... Oh Jesus, sins, sins! What would I not do to prevent sins!..." "Jesus, if a sacrifice would be necessary to see You happy, do not doubt that I would do it! Have I not come into this world to cry always? Every day is strewn with crosses. Oh Holy Cross I have embraced you...It is true Jesus that if I think of what I have gone through as a child and then as I grew up I have always had crosses. How wrong are those who think that suffering is a misfortune!". These last remarks, so delicately autobiographic (of Gemma's life) ends with a high lesson, giving us a candid but fraternal warning. Thus Gemma is also capable of expressing herself with love, conveying knowledgeable counsels from her intimate convictions.
" ...should I live in this world even for a moment without suffering, then I would ask You to let me die now.... the more I continue, the more I resemble You"
" ...who knows... if You would not have kept me close to the cross, how many times I would have abandoned You!...".
" Blessed be Jesus; blessed be the cross; oh, is it not in this where we find the true happiness? That Great God, who can do all things, will not allow that [ your children] will be without what is necessary. My dear sister, I want to give you courage, but what am I saying? Isn't Jesus enough To give you strength? Whoever loves Jesus is capable of suffering any cross. His love is so strong! May Jesus be your only riches!".
" ....an inner voice seems to tell me that we must continue at the foot of the cross for a little longer. If Jesus is nailed to the Cross, let's not complain if we must stay at the foot of the Cross a little more. Poor Jesus! Oh, if I had a heart made of all the hearts that are in love with You, oh my God, so that I could help You and compassionate You. I consecrate to You all the strength of my poor body and all my affections. May it never be true, that we my dear sister, will leave Jesus all alone on the Way to Calvary. But not only will we accompany Him to Calvary, but to the Cross, and unto death. Let us run towards the Cross, and also towards new crosses; together let us embrace them and say : " Oh! Holy Cross, if we think about the infinite love with which Jesus embraced you, let us make a final resolution never to run from you!. Dear sister let us remember - she had already written to her a few months earlier - that we are followers of that Jesus that suffered so much. No, it is not enough to have the cross under our eyes, or to wear it, we must have it at the center of our heart. Dear sister how many things come to me [at this moment] -I can not even tell you. Let us go together in front of Jesus Crucified... lets look at Him, elevated on the Cross. Should we complain if we must stay for some time at His feet?...". Some other reflections of the saint have a sober tone, interrupted at times by powerful explosions of affection, and most of the time they have the form of a dialogue. These personal reflections of Gemma point out the high level of spirituality of the saint and they can bring souls to self examination and resolve. ".....then, You loved me to this point? You have granted me so many graces; so many favours; and I... what have I done for You?" " Oh! Jesus what have You become? What happens to You, Jesus?....oh! The Holy Person [Humanity] of Jesus has become the person of amusement for all: they blaspheme my Jesus, they rebuke my Jesus, they curse Him, they hurt Him so much. Jesus, I am so surprised when I see Your humiliations. I do not want to hear about this anymore .... oh! if I could Jesus!... I wish with my blood... I wish to bathe with my blood all the places where I see You insulted! How could love do so much to Your Heart? Jesus what did these wicked ones do to You? Jesus aren't they tired?......No more blows on You, Jesus... It is right that when You want to give me a gift, You place the thorns on my head. It is I who sinned, You are innocent....I have sinned much....".
" Why are you so afflicted, oh my soul? You are offending your Love if you do not embrace with generosity the cross. You do not care about Paradise if you do not send your thoughts to Calvary. Do not be afflicted my soul: from eternity you are married to Jesus; together with His pains you are compelled to live crucified. Oh! Jesus, Jesus! Jesus my goodness!... I am famished for Your bread of Life, and I am thirsty for Your Sacramental Blood. Do You know why, soul of mine, I want you to embrace the cross? Because if the whips of the cross do not hit you a little, you are in danger. "Oh Jesus.. I know that the Cross is dear to You, and that on the Cross You placed all Your tenderness, all Your affections...Your love is not jealous to take it away from me when I ask it of You. Oh! crucify my soul or make me die. My Jesus... my adored goodness, how I love You!" "I tremble concerning myself. I look at my Crucified Jesus and I am ashamed. It comes to my mind when I think of Jesus in the midst of all His sorrows and His torments and I feel an increase in shame. Jesus in the midst of so much pain and spasms offers up His veins for the healing of the entire world. My dad [ Fr. Germano] what admirable patience! And I? I lament, I am afflicted and often I cry. I deserve so many pains because I am a wicked sinner. Oh! Dear Jesus, how much I am unlike You! I can't suffer anything without complaining!..." "Jesus; You ask of me love.... Who killed You Jesus? Love! Jesus, those nails, that Cross.... it is all work of Love... Oh! Jesus, what would happen if one day it could be said that I was consumed by Your Love? Do You know Jesus how I would want to die? As victim of love for You!". "Oh! Jesus, have pity on me! I have prayed so many times for others... have pity on this sinner that cost You Your Life. Forgive me, my God." I am an orphan of mother and father; have pity on orphans. I am a friut of Your Passion, I am a sprout from Your wounds.....". "You must be my teacher. The teachers of this world teach with their voice. You [teach] with sufferings. Always sufferings...and always with affection...."
"If we must suffer, let's suffer together. Who will have suffered more? You for love of me? Or I for love of You? "Today the cross tomorrow the wounds. What a scene Jesus that will appear ahead! If You are Crucified, I suffer with You. Oh, but most of the time when I look for You, I find You on the Cross. To meditate on Your Passion Jesus has always been a relief for holy souls.....and I.... Why am I so dismayed at suffering? Many times,....Jesus!... Oh Holy Cross! Today the Cross , tomorrow... When, when Jesus? Why complain? What comes from Your hands is very dear to me!... How wrong they are those who believe suffering [is a misfortune]. "I complain so much Jesus! My confessor tells me to think whether You have suffered more for love of me, or I for love of You. There is no contest!" "Tonight Jesus I want to suffer all by myself; or if You want to suffer too, then let us suffer together. 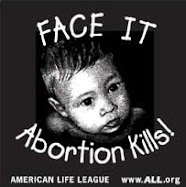 We can thus be one victim; are You happy, Jesus?..." "Oh! what did You say to me this morning Jesus? That love is formed by resemblance; but resemblance between us....is a Crucifix?!". "As proof of my love, make me remember that my duty is suffering. In Your life I see that You were filled with sorrows. Yes, Jesus I want to suffer always with You". "Oh Jesus, You give crosses to those You love. Jesus You are the love of all. You are the only love: I scream it out loud.....If You want me, I offer myself as a victim...". "How can I Jesus remain in front of You and say nothing of this Cross? Oh Holy Cross, with you I want to live and with you I want to die. I love the cross because I know that the cross is on the shoulders of Jesus". "Who will take me away from you? Maybe tribulations? Maybe the cross?... oh Jesus, I feel You....I feel Your blood flowing in my veins".
" You Jesus, to save my soul did not spare Your Life nor Your Blood. Jesus I too want to give my life for You. Do You believe it? At times I feel the strength of the martyrs. I would do everything You want. I will die gladly on the cross for You. Now Jesus every Friday as I look for You I find You always on the Cross. But how? Almost dead. What was it Jesus? The Love that You have for me brought You to this point?....". "Let the world come with all its treacheries; by now You see that my heart is all for You and towards Your sufferings". "Oh heart of mine, how can you not die at the sight of the Only Begotten Son of the Eternal Father on the gibbet?...." "I told You that You have suffered enough for me and for sinners. Come Jesus, if You wait I feel as if I will die. Yes my Jesus, the wounds that I caused You.....they are not Yours anymore but mine. 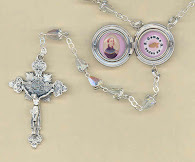 Oh Holy Cross; receive me together with Jesus. My God!'. "How well I feel the wounds of Jesus. They speak to me always of love and with such a sweet violence that I would.....". "Jesus, Jesus make me partake of all Your sufferings. Let us love suffering for Jesus, for love is dying in suffering for Jesus".
" O my God, could I love You as much as I want, and suffer as much as I want?" Oh dear pains of Jesus!". "My Lord Jesus, when my lips approach Your lips to kiss You, let me taste gall! When my shoulders lean on Yours, let me feel your wounds! When Your flesh will unite to mine, let me feel Your Passion! When my head will get close to Yours, let me feel the thorns! When my side approaches Yours, make me feel Your lance!" P.595 Any comment would be so much colder than the fervor of these darts perturbing the enchantment that only the words of the soul of a Seraphim could create. "Come, let us all gather the Blood of Jesus that He poured abundantly, and I the last of Your servants deserve not even a drop. I adore Jesus and the outpoured Blood. I hope Jesus that You did not pour out Your Blood in vain for me. Oh God! Jesus dies! Jesus I want to die with You!...Oh thorns, oh nails, how many times must I tell you? Take your revenge on me, not on Jesus. Jesus dies giving me life. 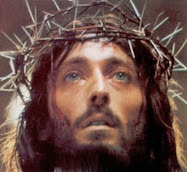 Passion of Jesus!...". "Oh Passion of Jesus, I love you! Angels of Heaven come! Come all, let us adore the Passion of Jesus!". "Oh Jesus who did this to You?..... Oh Holy Angels come, come but all of you to compassionate Jesus [ to pity with great mercy, -translator]. Passion, Passion of Jesus!... Let us all adore the Passion of Jesus, All! Oh....how much Blood! Oh Cross, why do you take revenge on Jesus? Not anymore on Jesus but on me! Oh cross, close to you I feel strong. I continually ask love for the cross. Jesus not to Yours but to the one that I am to embrace. I love it much!... It is on the Cross of Jesus that I have learned to love". "Poor Jesus!... How many blows, poor Jesus!.... They do not let go those wicked [men], but You have so much patience. Leave Jesus alone... beat me instead, not Jesus. Why do You take revenge on Jesus? Take it on me". We have thus contemplated the soul of Gemma. We have found the key to that inner vault of her interior soul, that secret vein that feeds her life and reveals in part the designs of Providence in her regard.....hardships, diseases, incomprehensions, diabolical assaults, together with spiritual anguish, sorrowful ecstasis... they are not a mystery anymore. The itinerary of her soul will be inspired by her heroic reply to the invitation that she hears from the height of the Cross. 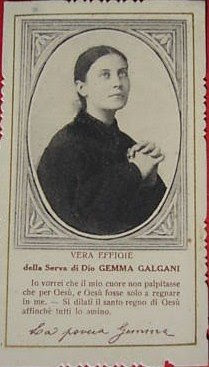 "The desire of Gemma - said Mrs. Cecilia - was to become a Passionist because of the austerity and the devotion to the Passion of Our Lord". "I want to become a Passionist - she wrote to Fr. Germano - I suffer because I can not obtain my desire yet...". Time passes on and I can not take it anymore, help me, help me and make me a Passionist, Jesus wants it, Jesus wants it!'. I die of desire.... " My Jesus what are You doing? You have placed in my heart the vocation to become a Passionist and then You keep me from it? Don't You want to give me the grace to fulfill it?". "Will I be able to hope that the last place will be saved for Your most humble daughter of St Paul? [St Paul of the Cross, founder of the Passionists -ed.] I will be good You know, I will always obey. Tell the nuns to let me serve among them, I will be the servant. I can You know, I can sweep, I can wash dishes, fetch water and I can sew. I will be obedient to all. Will You tell them to take me in? Tell them I suffer so much, it is a big sacrifice that I feel if I am not a nun. All I would do is cry. At times the sorrow is very strong because I see myself so far away... for that I feel terrible pains...". Why so much insistance on the part of Gemma? "Jesus can not take it anymore - she explains to Monsignor Volpi - ...I am the victim, Jesus my sacrificer. I can not tell you more." Gemma was convinced that only by entering the monastery she could have satisfied her wish for martyrdom and transformation into her Crucified Spouse. Only later on in life did she come to understand and accept God's plan for her. Thanks so much fopr your letter. I am very glad to hear that you appreciated this article and also the website. For the above article, and several others on this website, a friend in Saint Gemma, Mrs. Rita Dunn, has kindly translated excerpts from the book "La Povera Gemma" from the original Italian. It is a large, voluminous book, 1014 pages total, full of information on St Gemma, and lots of interesting photographs (in black and white. It is really the "Bible" so to speak, on St Gemma. Other aticles on this website from this book include "Gemma was beautiful" and "My Mother, Crucified" and "St Gemma suffering in union with Jesus" and "Gemma experiences the dark night of the soul"
I don't know of any plans to translate the entire book. Thusfar it has never been translated into any other language. Certainly, it would be a large undertaking, given its size. Perhaps someday someone will be called to do it. Thanks again for your letter and may God bless you and yours!